Hawaiian Parties are always popular at this time of year and make a fantastic theme helping to get the party in full swing. 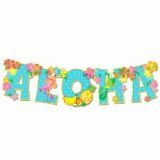 We have a loads of Hawaiian Party Ideas for you and a huge range of Hawaiian Party Novelties to add atmosphere to your Hawaiian Theme. These include Hawaiian Leis, Hawaiian Decorations and Bunting which is always an amazing choice as well as Hawaiian Fancy Dress and Hawaiian Accessories. We would love to hear from you if you are having or going to a Hawaiian Themed Party. Music Festivals play a big part in summer culture and are fantastic events. They provide the perfect opportunity to get together with friends and to add to the mood Music Festival Accessories are great fun. We have lots of ideas for Music Festival Party Novelties to wear such as Flower Garlands and loads of Glow and Flashing Products to take you into the evening. We would love to hear from you as which Music Festivals you are going to this year. Pride Festivals soon start to take place throughout the country and we have lots of Rainbow Pride Party Accessories for you to choose from all adding to the spirit of the occasion. Whether you are attending an event or hosting a Rainbow Pride Themed Party Rainbow Flags are perfect to wave or use as decorations and Rainbow Pride Hats make ideal Rainbow Accessories. We would love to know if you are going to any Pride Festivals and if you will be wearing Rainbow Pride Glasses or Rainbow Masks to add to the atmosphere.